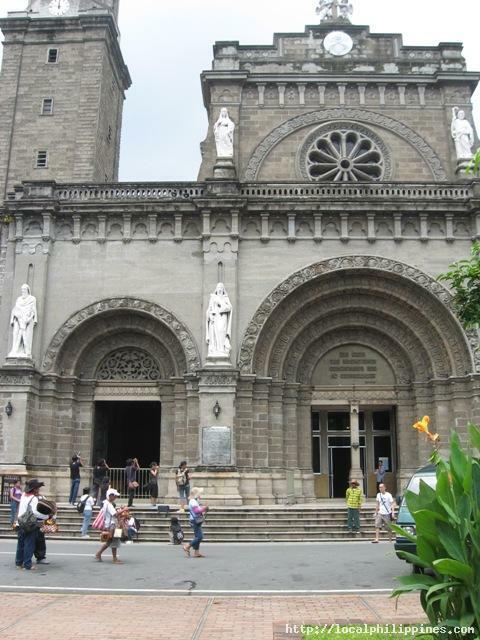 The seat of the Catholic Archdiocese of Manila, is presently the 6th cathedral to rise on the site since 1581. Previous structures were destroyed by typhoons, earthquakes, fire and the last war. Rebuilt on the second half of the 50's through the efforts of architect Fernando Ocampo and Archbishop Rufino J. Santos. The cathedral incorporated the stone carvings and rosette windows of the old cathedral. Stained glass windows celebrating the Christianization of the Philippines light up with its clerestory. Mosaic artwork decorate three of its side chapels. From Mabini and Pedro Gil Sts., ahil a PUJ bound for the pier and get off at Bonifacio Drive Intersection. the Manila Cathedral is a 10-minute walk going towards Aduana St. As an alternative route, take any pier-bound jeepney in Quezon City and get off at Aduana Street.